Around The World and Back Again: Visit The Cloisters. Take food. Visit The Cloisters. Take food. Take the A Train to 190th Street. Walk about 15 minutes through the gorgeous Fort Tyron Park, following the path that winds along the Hudson River. Your reward: The Cloisters. Today, after five years spent living just a few miles away, I finally made the trek to visit The Cloisters, a branch of the Metropolitan Museum located in northern Manhattan. And it was certainly worthwhile – particularly on a day as gorgeous as today happened to be. The museum, in all its medieval glory, is nestled inside Fort Tyron Park in the Inwood neighborhood of Manhattan. The park itself is gorgeous and immaculately maintained, and with sweeping hilltop views of the Hudson River, lush gardens, chirping birds and minimal crowds, you might for a moment forget what city you are in. Now, I do not claim to be a lover of 12th-15th century medieval European art, which is the prized focus of The Cloisters. In fact, I know little about the subject and admit to have neared boredom after about 30 minutes inside. But as someone who is all about ambience (call me shallow) this stately structure does not disappoint. The medieval architecture (of the same time period, for those who are interested) is truly remarkable, offering a potent reminder of how enterprising and creative our ancestors were, and how completely lazy we are today… Ikea, anyone? The maze-like construct includes a number of striking examples of unfathomable architectural ability, and the building is designed around a series of intimate courtyards – also known as cloisters, funny enough – that house trickling fountains, singing birds, plants in bloom… and the occasional child-on-a-leash. Beautiful and quite peaceful, The Cloisters is a smartly laid-out space that provides a welcome reprise from the frenetic pace of pretty much every other museum in Manhattan. The colorful gardens boast everything from medicinal herbs to poisonous flowers to your everyday root vegetable; listen in on one of the daily Garden Tours for details on how to cook up a mean veggie pottage, medieval style. If this lecture gets your gut growling, as it did mine, you might want to pop on over to the adjacent Trie Café for a more modern selection of café cuisine. Traveler’s tip: Before heading to The Cloisters, pack a picnic. The café inside the museum is anything but; on this busy Sunday afternoon, the café actually ran out of food. Nothing left but a few oranges and some slices of pound cake. Rapidly diminishing blood sugar levels brought an end to this museum visit, and so my friend and I ventured hungrily back into Fort Tyron Park in search of sustenance (but not without first considering that prized vegetable garden just around the corner). Well, it seems as though the always-there-when-you-need-‘em hot dog and pretzel vendors that blanket New York City do not dare venture north of 125th Street. No food to be found in this park. Anywhere. We were nearing desperation, seriously contemplating whether we could crash some kid’s birthday party, when suddenly we spotted it up ahead. Like a beacon in the night, a lighthouse pulling us out of the starvation-induced fog… there was the Mister Softee truck. Anyone who has spent a decent amount of time in New York City knows about Mister Softee: that ubiquitous white van that seems to sit on every corner of the city, playing creepy music while serving up overpriced ice cream sundaes and chocolate-dipped cones to overweight kids. I am not a huge fan of ice cream in general, and had not yet experienced Mister Softee personally. But clearly, today was the day. As far as ice cream goes, a Mister Softee cone leaves much to be desired. In fact, it kind of sucked. But beggars can’t be choosers, and as I polished off that last miraculous trace of ice cream-drenched cone, I was grateful to acknowledge one simple and utterly reliable fact of life: when in Manhattan – anytime of the year, in any part of the borough – there will be a Mister Softee truck somewhere nearby. And it will be playing that creepy music. And so my friends, the moral of the story is this: Visit The Cloisters. And if you dislike bad soft-serve as much as I do, take food. 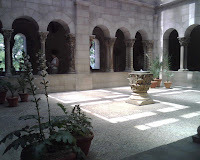 Ah the cloisters -- I went last in February. Must go again soon - before it gets cold! Great post! It's too bad that you missed The New Leaf Cafe. Founded by Bette Midler as a mean to help fund the preservation of the park, this lovely restaurant serves up brunch over the weekend and plays live music on some mid-week nights. On warmer days, they open up the terrace in the back for brunch. I realize that I sound like an advertisement for the cafe, but I just get excited about these hidden New York gems. Their cocktails are top-notch, and their food infinitely better than Mister Softee. I realize that's not saying much. But if you want ambiance--which this place has more than enough of--and good food, this would make a lovely date spot. All this prattling on about brunch has made me hungry. I think I will get dressed and put my name on their waiting list--no reservations accepted for brunch.